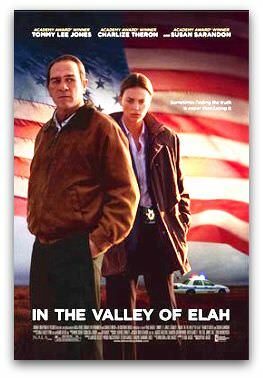 In the Valley of Elah: 121 minutes. Rated: MA. Director: Paul Haggis. Starring: Tommy Lee Jones, Charlize Theron, Susan Sarandon, Jason Patric, James Franco, Josh Brolin, Frances Fisher, Jonathan Tucker. In the Old Testament story, the Valley of Elah is the place where the boy David slew the giant Goliath with a mere slingshot and stone. It's a story of courage against the odds; the triumph of God's anointed man over an evil, and seemingly insurmountable enemy. But in Paul Haggis' film, it is almost impossible to find a simple enemy or an easy hero, because this is a tale about the murky fallout of America's war in Iraq. Hank Deerfield (Tommy Lee Jones) is a Vietnam veteran and retired army policeman. He has his own gravel-hauling business in Tennessee, where he lives with his wife Joan (Susan Sarandon). When Hank gets a call from the army, telling him that his son Mike, recently returned from Iraq, has gone AWOL from Fort Rudd in New Mexico, he decides to drive down and investigate the disappearance himself. What he finds there is an army bureaucracy that shuts him down at every point, while the young soldiers in his son's unit are unwilling, or unable, to shed any light on the mystery. Hank's only ally is the civilian detective Emily Sanders (a fresh-scrubbed Charlize Theron). She's a single mother trying to get on in her job while ignoring the rampant sexism within the force. She's a good cop, but not nearly as good as Hank, who shows her, on numerous occasions, how real investigative police-work should be done — with style, ingenuity and a dogged intelligence that is truly impressive. What they find together is horrifying and almost incomprehensible. A parent's worst nightmare. This film belongs to Tommy Lee Jones who totally inhabits the role of the searching father and stoic ex-military man. He looks deathly grey — still strong, but with lines so deep around injured-looking eyes, that you can't help thinking he's not long for this world. Maybe it's just his type, the truly honorable soldier, that is fading and becoming extinct. In the Valley of Elah is a sombre, unhurried film. Shot by Roger Deakins in a style that takes in the wide flat expanses of the desolate army town, we see the chicken factories, fast food joints and girly bars, and the streets lined with jeeps full of young men damaged by a war they don't understand. The message here is, for the most part, restrained — in sharp contrast to Haggis's didactic Crash. Yet he can't resist a final flag-waving scene that feels like an unnecessary sermon. Rochelle Siemienowicz is the films editor for The Big Issue Australia. She has a PhD in Philosophy and Cultural Inquiry with a focus on Australian cinema and globalisation. Rochelle blogs at www.itsbetterinthedark.blogspot.com. Recent articles by Rochelle Siemienowicz. I loved your review. It makes me want to see a movie I would otherwise have bypassed as just another thing I haven't time to explore. Her skin bears witness to his absence ... The rooms, ambivalent about space, contract/expand at will. Day by day she is shrinking.